Team GBR is aiming to wrestle the B14 Ashes off of the Aussies who won the last event at Lake Garda in 2016. The event will be held in waters similar to that of Whitstable Bay/The Swale at the top of the Tamar River in Bell Bay. The question is, will the two top GBR teams be able to do make a successful raid and catch the Aussies on the hop. With little to chose between the top 2 GBR and top 5 Aussie teams, there will no doubt be an element of luck as well as skill to see who stands tall come the final showdown. One thing is certain the fat lady will not be singing till the last throw of the dice. Woollahra put on a brilliant sunny day for the first round of the NSW B14 States yesterday. Blue skies and 16 to 20 knots combined with some interesting waves to make for some competitive sailing. Around 15 B14's are heading to the Midway Point Yacht Club this morning to take part in the first major regatta for the 2017-18 sailing season, the Sarah Lovell Pittwater Regatta. The regatta consists of 8 races across the weekend with racing commencing at 1pm Saturday and 12noon on Sunday. Crews from across the state are continuing their preparations for the Tammar Cove CST Composites World and Petuna Bell Bay Aluminium Australian B14 Championships which are being held on the Tamar River at Port Dalrymple Yacht Club from 27 December 2017 through to 6 January 2018. Local Southern Tasmanians, Robbie Hunt and Ben Price are racing and are expected to be front and centre at the world championships. The Sarah Lovell Pittwater regatta will be one of their only weekends of practice together as Hunt and Price live at opposite ends of the state making training a little challenging through the week. This weekend sailors are also promoting the Movember Foundation as part of the regatta, targeting the conversation of men's health around the event.Have you had your prostate checked? Movember is coming to its peak with moustaches getting to their maximum length across the globe. Updates will be posted over the weekend on the B14 Skiff Sailing page on Facebook. 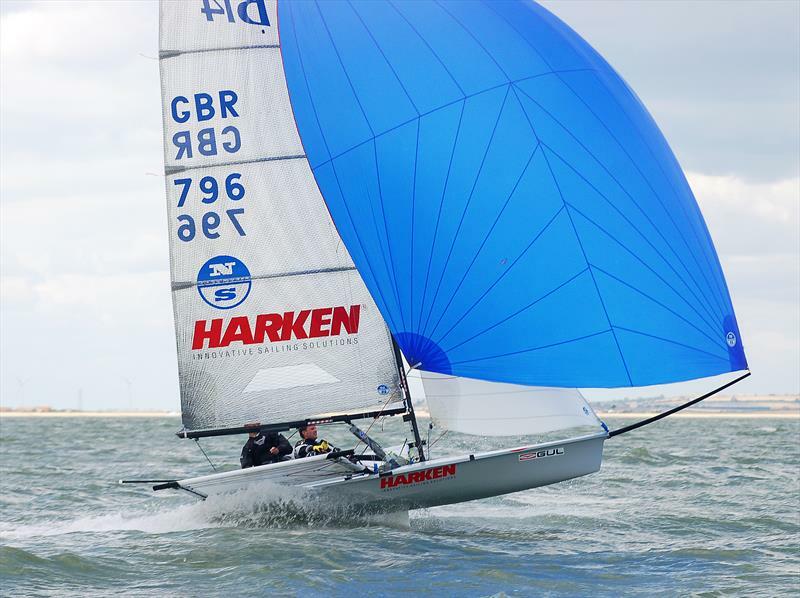 Day 4 of the Gul B14 nationals, only 4 of 10 races had been sailed, With a maximum of only 4 races on the day, the championships effectively started again with only one discard available. Looking at the form guide and odds, would it be a good day to place a bet.